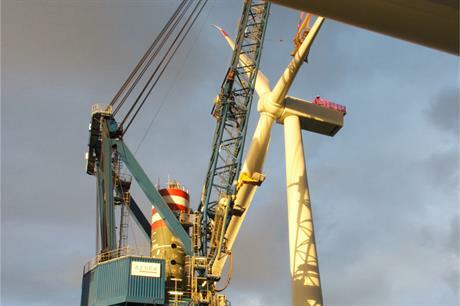 GERMANY: A2Sea has installed the first turbine at Dong Energy's 312MW Borkum Riffgrund 1 project in the German North Sea. The first of 78 Siemens 3.6MW turbines was installed by A2Sea's Sea Installer vessel at the site 37 kilometres off Germany's north coast. This project landmark is a few weeks later than scheduled following a delay in the turbines being delivered. In August, Siemens admitted to manufacturing problems as a cause for the delay. Siemens and developer Dong said the project's commissioning date – planned for the first half of 2015 – should not be affected. The SWT-3.2-120 turbines have been optimised by Siemens to increase the output up to 4MW. Monopile foundations at Borkum Riffgrund were installed in July. One of the foundations is a full-scale prototype of a suction-bucket jacket foundation, which was installed in August. In January, the Carbon Trust awarded £6 million (EUR 7.3 million) to Dong to build the foundation as part of the Offshore Wind Accelerator programme.